Hey !! Me again & with more free inserts / dashboard / dividers… I really enjoy creating all these so I hope to deliver more and more each week. If you just discovered me I’m a 30ish lifestyle blogger from Toccoa, GA (A very tiny town you prob have never heard of). I have two tiny humans that I love so much !!! My Blog is very laid back and fun !! Check back often for new stuff !! * These are always sized ready to print all you have to do is cut them out I use a cut board it’s just much easier & comes out more clean cut. * I print most of my inserts @ home but recently started using a printing service and it’s actually cheap and they come out even better. * These are all “personal” size inserts I do create A5 sometimes. Please let me know if you have any printing questions I will answer quickly !! I love everything gypsy style and what’s better than a few amazing quotes to get you day started and be reminded that you are in total control !! As I continue on this planner creating path please please please let me know what’s hot right now and what yall want to see in the days to come. Hope you love these !!!! Sign up for my news letter as well and you will be notified when new sets come out. I do not send tons of email very rare actually !! I love these! They are so cute. I need to work on my 2016 planner. I swear I am going to be better next year. Thanks for sharing! I am just really getting into planning. I think I am going to try my hand at making a few stickers for my personal use. Do you create stickers? Yay for printables! These are totally adorable too. Insert heart eye emoji! I need to make a planner. I might work better when I am organized. I love printable planners! This color scheme is gorgeous! Yay !! Thx so much. These are so lovely! Thank you for sharing them Laci! Keep them coming! I love printables!! So fun!! looks really awesome, i love the quote, there's no way that i was born to just pay bills and die but its a reality, as long as we are living we have to pay numerous bills to live. Those layouts are lovely! Thanks for sharing them. 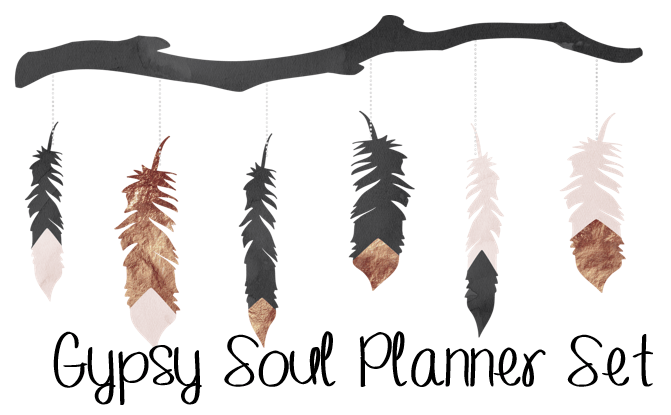 It sure would be great to make your own planner! These are so cute! Now I just need to get around to making my own planner! Those are so inspirational. I really love this collection! You're sweet to offer them! Very nice of you! They look useful! Thanks. So pretty I love them. Oooo loving the planner!!!! I'm still in the search for mine! My sister in law loves all things gypsy too. It's a nice laid back feel, isn't it!